You can buy blood and bone fertiliser, so why not use your own blood to fertilise your plants? Blood contains three macronutrients which plants thrive on ~ nitrogen, phosphorus, and potassium. Instead of buying fertiliser, you can harvest your menstrual blood each month and feed it to your plants. We are presently in a world where we are breaking the taboo of talking about menstruation. It seems we are readdressing the topics that would have once been covered by our ancestors, including treating our menstruation as more sacred than ‘the curse’. Also, by offering our blood back to the earth ~ In gratitude, honour and for nutrition. It is easy to over fertilise plants, so don’t over do it. Once a month is a good space between feeds (or the length of your cycle!). And always make sure you have diluted your blood to ensure absorption and not to overbear the plant as it is very rich (about 1 part blood to 10 parts water). Roses flourishing with blood food. I have had very good results feeding roses my blood, and apparently tomatoes love it too. But I justfeed it to anything growing in the garden… particularly a lovely rowan tree I have great fondness of. If you don’t have a garden, you can try taking your blood for a walk and giving to the earth in the local countryside. Choose discreet spaces, and if in doubt, you can dig a small hole to pour your blood in, then cover it over. Depending on your beliefs and desires, you can choose how you give the blood to the earth. 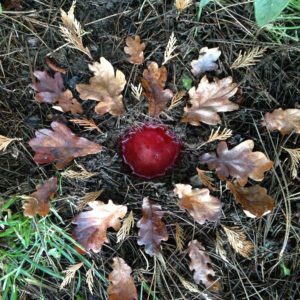 Whether you perform a ritual; say a simple ‘thank you’; build a nature mandala or just pour it on. ~ Washable pads ~ soak your pads in cold water, squeeze them out and use this water to feed your plants. ~ Menstrual cup ~ empty your menstrual cup in to a jar, dilute 1 part blood to 9 parts water, and use this to feed the plants. ~ Tampons/disposable pads ~ Soak in water to draw out the blood, feed the plants this water.